La Joya ISD parents listen to speeches during graduation from the Parent Police Academy Thursday, April 12, 2018, in Mission. 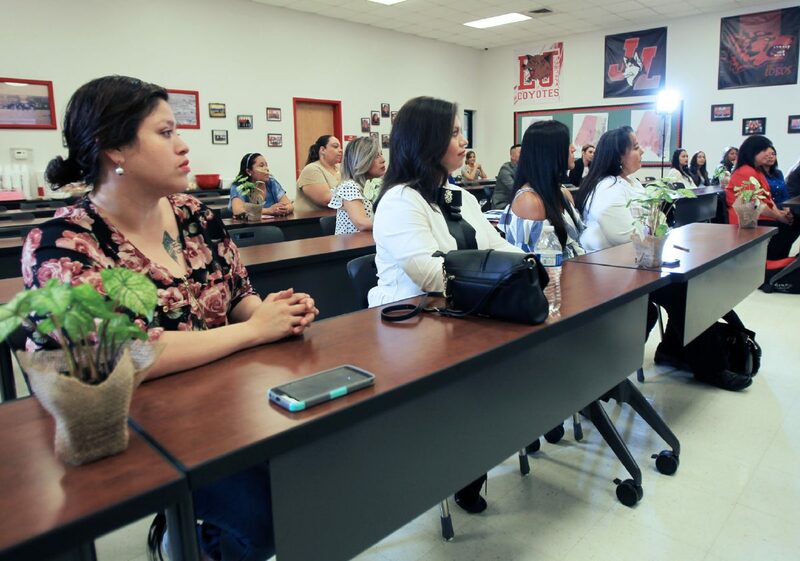 MISSION — One by one, 15 proud parents of La Joya ISD students were called to the front of a classroom to receive a degree from the Parent Police Academy, the first of its kind as the school district aims to involve parents in safety and security procedures. In the midst of continuous school shootings across the nation, and individuals on social media threatening similar acts of violence, it can be easy to create and spread panic among students and parents, leaving them uncertain of whether schools are safe. With this in mind, La Joya school district officials decided to answer some of the parents’ most pressing concerns by involving them in a class that put them in the middle of the action. Their eight-week curriculum includes topics such as crisis intervention, active shooter and mental health. Jose Salinas, LaJoya ISD police officer, holds a stack of new applications to be chosen by graduates during the La Joya ISD parents' graduation from the Parent Police Academy Thursday, April 12, 2018, in Mission. To kick off the first Parent Police Academy, the district police department partnered with the school district’s Department of Family and Community Engagement to get about 20 volunteers to participate in the academy. Volunteers were required to attend a three-hour session every Thursday for eight weeks, in which they were not only told how the district police department prepares, but got them involved by taking them to shooting ranges, having them go through simulations and inviting the Hidalgo County Sheriff’s Office and Border Patrol to make presentations on their departments’ involvement with school districts. Before the end of the eight weeks, word of mouth on how the academy works got them more than 120 new parent applicants. 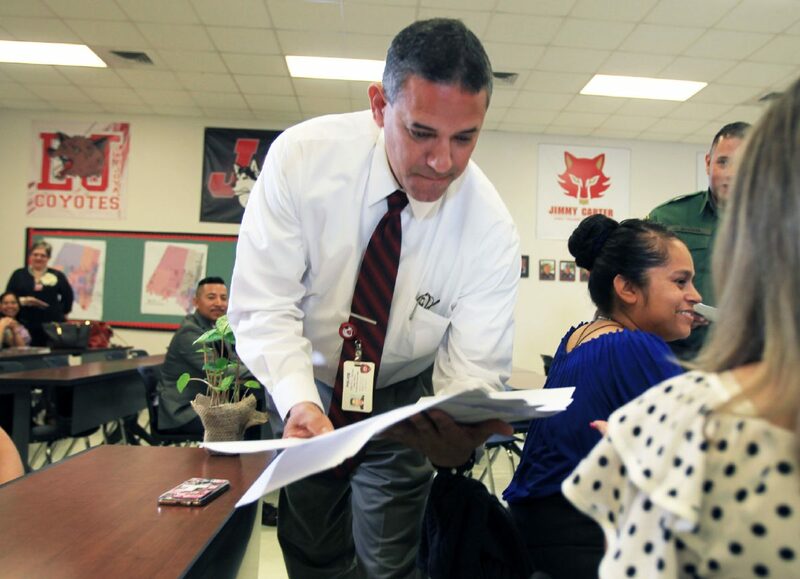 Due to the demand, Gonzalez said they are already getting ready for the second cohort to begin this week, but this time — because the school year is about to be over — they are planning to meet two days out of the week to finish sooner. Because this is the first academy, he said they might change things up as they go depending on the needs and feedback from parents. So far they are already thinking of offering at least one course in Spanish and having a mini academy on the weekends for teachers and staff, who in many cases are the first to get safety questions from parents. After their graduation, parents took group photos and shared a pot luck lunch with the district staff, and representatives from the sherriff’s department and Border Patrol. Right after their meal, their job was to choose applications at random to select the parents who will follow their footsteps.